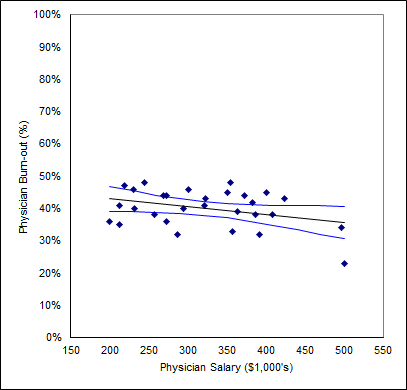 Plot of percentage of physicians burnt out versus physician salary on a per-specialty basis. Includes linear regression and confidence interval. So this data is all well and good, but the problem is that that relationship is so exceptionally weak! It’s a very weak correlation! In fact, looking at the 95% confidence interval plotted there, it’s entirely possible that the actual burn out increases with salary! To drive this point home, I adjusted the vertical scale to zoom into the data and then drew a red line for the possible true relationship. See below. 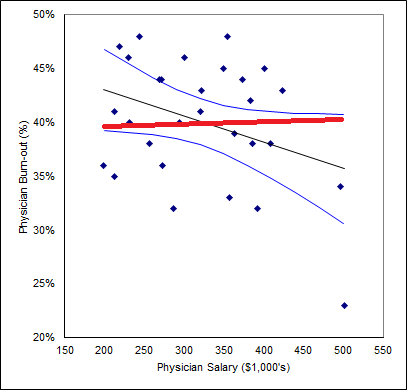 Same data as above with a hypothetical relationship that could be the true relationship between salary and burn out as shown by the red line. I also checked those two data points to the far right — they’re courtesy of plastic surgery ($501k, 23%) and orthopedics ($497, 34%). Technically, they’re not outliers (using the 3 standard deviations definition), but they’re awfully close (22.6% is the cut off for 3 standard deviations for the burn out data). As such, I’ll leave them in. it’s entirely possible that the actual burn out increases with salary! However, as a check, I analyzed the data without those two data points and the relationship plummets to next to nothing. But not withstanding, what is the proposed relationship between physician burn out and salary? 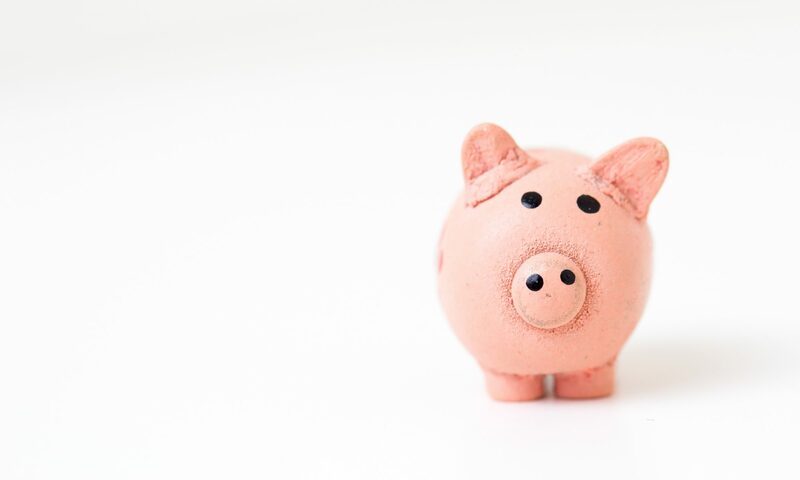 Essentially, for a $100k increase in salary, this data suggests that there will be approximately 2 MORE physicians per 100 physicians that are not burned out. And that’s assuming you paid all 100 physicians $100,000 more. Per year. Overall, I conclude that there isn’t enough of a relationship here to draw any conclusions about salary and how burned out one might be. In fact, burn out is an issue affecting other industries too and based on this data, physicians are actually doing very good! Hard to believe! How so? 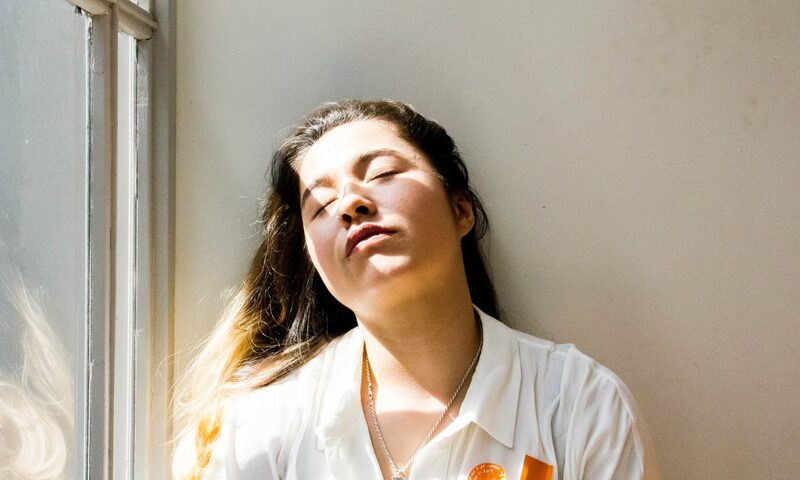 Check this out — 57% of tech employees surveyed stated that they suffered from burn out. 57%. Even the worst physician specialty (here’s to critical care at 48%) isn’t even close to that! And the worst offender in that tech study were employees of Credit Karma with over 70% claiming to suffer from burn out. 70%!!!! 57% of tech employees surveyed stated that they suffered from burn out. Even the worst physician specialty isn’t even close to that! I don’t know what different companies pay their employees, and in fact, doing a similar study across a tech company would be very difficult as I believe the spread in salaries would be far greater than the spread in salaries amongst doctors of the same specialty. However, the lowest burn out rate among tech companies was at Netflix with only 38% burn out. That’s on par with rheumatology, anesthesia, and gastroenterology. But I doubt Netflix is paying on par with those specialties on average; $257k, $386k, and $408k, respectively.